Leslie Griffin Law and religion: cases and materials, 2008 Supplement, Foundation Press, 2008. While Law Center Professor Leslie Griffin’s 2007 casebook has garnished critical accolades, this 2008 supplement was hailed by her peers as the high art of the casebook supplement. It ties together new cases, news developments, and scholarship, with thought-provoking questions on these new materials along the way. Even the Acknowledgements is filled with instruction to useful online resources for researching the subject of law and religion. 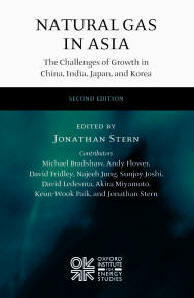 Natural gas in Asia: the challenges of growth in China, India, Japan and Korea, 2nd ed. Oxford University Press for the Oxford Institute for Energy Studies, 2008. This book completely updates a 2002 study on the future of natural gas in the major energy markets of Asia. The authors discuss the major current and potential gas markets in China, India, Japan and Korea, as well as the potential supply of pipeline and liquid natural gas to Asia from Russia, Central Asia, South East Asia, Australia and Middle Eastern countries. It also looks at the substantial gas markets emerging in China and India which are at the early stage of introducing large scale natural gas use in cities. Domestic and international economic opportunities, political obstacles and other challenges are addressed. Peter L. Lindseth, Alfred C. Aman, Jr. and Alan Charles Raul Administrative law of the European Union, ABA Section of Administrative Law and Regulatory Practice, c2008. Wayne Dale Collins, ed. Issues in competition law and policy, ABA Section of Antitrust Law, 2008. Mimi Laver and Andrea Khoury Opening doors for LGBTQ youth in foster care: a guide for lawyers and judges, ABA Center on Children and the Law, 2008. Kyndra Miller Rotunda Honor bound: inside the Guantanamo trials, Carolina Academic Press, c2008. Mary Ann Glendon, Paolo G. Carozza, Colin B. Picker Comparative legal traditions in a nutshell, 3rd ed., Thomson West, c2008. The 18th annual National Institute on Health Care Fraud, American Bar Association, Center for Continuing Legal Education, c2008. The 2nd annual National Institute on Cyberlaw, Expanding the Horizons, American Bar Association, Center for Continuing Legal Education, c2008. Kenneth A. Adams A manual of style for contract drafting, 2nd ed., American Bar Association, 2008. Steven A. Armatas Distance learning and copyright: a guide to legal issues, American Bar Association, 2008. Ellen S. Podgor, Peter J. Henning, Neil P. Cohen Mastering criminal law, Carolina Academic Press, c2008. Carole Stern Switzer, Peter Gray CERCLA: Comprehensive Environmental Response, Compensation, and Liability Act (Superfund), 2nd ed., American Bar Association, Section of Environment, Energy and Resources, c2008. Alastair Hudson Understanding equity & trusts, 3rd ed., Routledge-Cavendish, 2008. Paul R. Rice Electronic evidence: law and practice, 2nd ed., American Bar Association, Section of Litigation, 2008. George L. Paul Foundations of digital evidence, American Bar Association, 2008. Jim Bullock The IP licensing lawyer's job: a survival guide, ABA General Practice, Solo & Small Firm Division, 2008. John Heinz, ed. Analyzing law's reach: empirical research on law and society, American Bar Association, c2007. Jeffrey A. Brauch A higher law: readings on the influence of Christian thought in Anglo-American law, 2nd ed., William S. Hein & Co., Inc., 2008. Michael V. Frank Choosing safety: a guide to using probabilistic risk assessment and decision analysis in complex, high-consequence systems, Resources for the Future, c2008. James C. Freund Smell test, American Bar Association, 2008. Theodore A. Potter, ed. Legal research in Wisconsin, 2nd ed., William S. Hein & Co., 2008. William Drennan Lay words for lawyers, ABA General Practice, Solo & Small Firm Division, c2008. Wayne Schiess Preparing legal documents nonlawyers can read and understand, American Bar Association, c2008. Michael J. Bradshaw, ed. Natural gas in Asia: the challenges of growth in China, India, Japan and Korea, 2nd ed., Oxford University Press for the Oxford Institute for Energy Studies, 2008. Center for Professional Responsibility Model code of judicial conduct, American Bar Association, c2008. Vincent S. Walkowiak, ed. The attorney-client privilege in civil litigation: protecting and defending confidentiality, 4th ed., Tort & Insurance Practice, American Bar Association, c2008. Raj Panjwani Wildlife law: a global perspective, American Bar Association, Tort Trial & Insurance Practice Section c2008. American Community Survey: field representative's manual. Legacy of the trans-Atlantic slave trade: hearing before the Subcommittee on the Constitution, Civil Rights, and Civil Liberties of the Committee on the Judiciary, House of Representatives, One Hundred Tenth Congress, first session, December 18, 2007.